I wasn't kidding last week when I said this page wasn't gonna be about fonts at all! Instead it's about...extremely regular, normal humans. For example, meet Mrs. Bridgman. She wears regrettable shoulder pads, plucks her eyebrows too much in the middle, and has very muscular legs from Pilates. She's not a major character in this comic, which is why it's not a spoiler to tell you all these details ahead of time. And meet Louis Pepping! He does very well in school, but he doesn't really want to brag about it, due to his massive anxiety. He's pretty much the main character of this comic, along with Times New Roman, so if you haven't seen it already you can check out his "entry" on the cast page up top. I love him, he's my tiny shy baby, and I hope you'll grow to love him too. If you're wondering why the lettering seems a little messy on this page (in contrast to my careful font lettering in the previous scene) it's a careful choice I made to visually distinguish when a human is speaking, vs. when a font is. Of course, this doesn't really seem necessary in a scene with no fonts...but it'll become very important later on, trust me! Emma, the idea of "The League of Fonts" is taking an AWESOME direction! Wednesday is my new favorite day of the week now! Anyway, aside your awesomeness, I was wondering how do you draw your comics and what software do you use to add color, etc.? Keep up the great work. Oh my gosh, thank you so much! I'm SO happy you like it so much, even when I haven't even been running it for that long yet! It really makes my day to read stuff like this. I have a bit of a different process for LoF than I did for my old webcomic: it's more involved, and I do much less of it on the computer. The ENTIRE run of League is already scripted (over 200 pages of script!) so I already know exactly what happens in each scene. I start by dividing each scene in the script up into approximate page breakdowns, and thumbnail each page. (A thumbnail is like a messy "rough draft" of a page). I do more detailed thumbnails for League than I do most things, and rather than drawing them tiny, I draw them at 50% of the final page size. I then scan them in, blow them up to the page size, and print them out just on plain printer paper. I use the thumbnail lines as a rough sketch, and pencil on top of them (just using a mechanical pencil on printer paper - I don't think there's always a need for fancy supplies!) For inking, I lay a piece of transparent vellum on top of my pencils. It's like a thicker version of tracing paper. I ink on top using a traditional dip pen that I dip into a bottle of ink, and technical pens for things like the panel borders and lettering. Then I scan the comic and color it in, using a software called Photoshop! But you could pretty much use any software you want to do the kind of coloring I do. I don't use any special effects for shading, it's all just flat colors, and I'll adjust the values by hand if I want the colors lighter or darker. Thank you Emma for describing the process! I can feel Louis emotions right now...being called by the teacher is my worst fear! No problem - I love answering questions like this! No one art process will work for anyone, but I'm pretty happy on what I've settled into over the years. I'm so glad Louis's feelings are relatable to you - you'll get to see even more of them tomorrow! Wow! Thanks for describing that for us! I had NO idea how complex your work is. there is a lot of technique involved! Unfortunately, there isn't an edit function built into the site yet since it's all on custom code (not using a pre-made commenting platform). I'll see if we can add one, but for now, it'll have to stay. But don't worry, everyone makes typos! I didn't even notice yours! Yes! That was a purposeful slight parallel, I'm actually so glad you caught it because I thought it was too subtle for most people to notice!! And I'm SO happy you like the comic so far - I hope you will continue to enjoy it, too! Charter school seems very much present day, but many aspects of the classroom remind me starkly of a throw back to the 80s... shoulder pads and the almost rainbow pattern on the sleeves of the boys uniforms most obviously. Glad to see you're back and have recovered enough to do stuff you are passionate about again. The sleeves on the uniforms are just because - you'll see later - one of the main motifs I incorporated in my character designs for this story is a lot of patterning in the colors, so Louis's school uniform ties into that because he wears it a lot. And the shoulder pads are mostly because shoulder pads are always funny to me, regardless of decade. At the same time, even though I always have SOME topical jokes that'll connect things firmly to the present day, in general I try to keep my longer narrative comics slightly timeless, incorporating elements from various decades. That way, the story won't seem to get dated quite as easily! That's one reason a lot of my protagonists rarely use cellphones, for instance. The colors (especially Mrs. Bridgman's), the cuffs of the sleeves, Louis's highwater pants... it's almost like I'm back in elementary school! Louis's bangs, however, seem much more in tune with 2000s styles. I could probably safely avoid 80s fashion for the rest of my life... late 90s fashion though, I must admit I seem permanently stuck in it during my casual hours... jeans, black concert tees, and even the sideburns, when my jobs allow for such things (in my defense,I have had sideburns my whole life, including as a baby). The highwater pants are just because Louis's parents don't want to buy him new pants every time a pair gets too short for him ;) It's not a purposeful design of the clothing. You'll see in the next page that none of his classmates wear their pants that way! 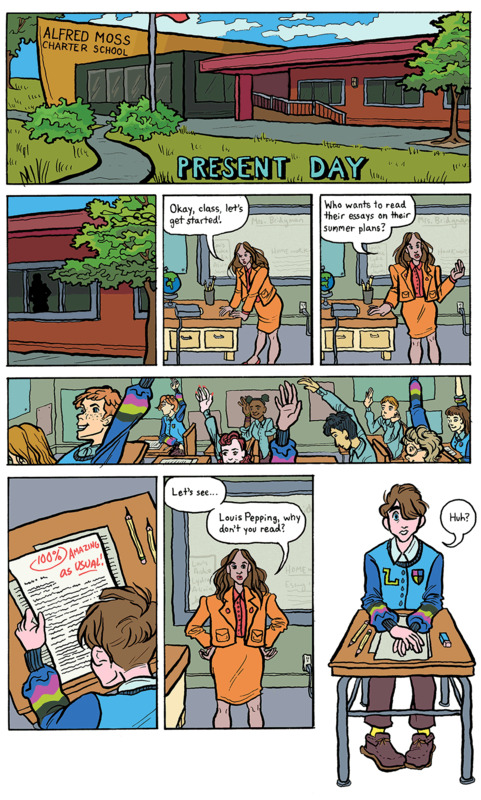 The classroom setting in this comic, characters included, reminds me of the magic school bus. Haha, I like that comparison! Suppose I might as well stick with the same nickname here. Some people might even remember me, if I'm lucky. It's great to see your work again. I look forward to watching this story develop and it seems like you're already off to a fantastic start. I can't imagine trying to hand letter all those fonts, but then I dabbled in calligraphy at one point too so maybe I can, either way it's a ton of work. Your style and artwork on this comic so far have been lovely. I'm glad to hear you're doing better now than you've been. Hi there - I ABSOLUTELY remember you and I'm so happy to see you here, it really warms my heart! I'm so happy you like this comic so far, I've worked really hard to make the art as good as I feel befits the story. People seem to be really enjoying the hand-lettered fonts, whereas to me it felt like a no-brainer that that's what I had to do to make things look nice, haha! I'm really glad I'm doing better as well. Thank you for the well wishes! Same, Louis, saaaame. Anyway, Louis is a cutie. Thank you! I'm glad you like him! What an unceremonious introduction I've given him, though, haha...just sheer terror at Reading In Front Of The Class. Nice contrast with what happened before. Looking forward to seeing where this is going. Thank you! I was hoping it wouldn't be too much of a shock to suddenly have such a sharp transition, from the 1930s font world to the present day. I'm glad you're intrigued, though - and trust me, the storylines/characters will start to intertwine! Ooh...you've set the scene for some great character development! Which is one aspect of comics I always enjoy - I can't wait to learn more about Louis as the story goes on! I'm so happy you're excited for this character! I'm glad you're hand-lettering your comic, even though I imagine it's a ton of work. Great idea having the human-speech lettering be sloppier than the font lettering, too. This is going to be such a fun comic to follow! I'm so happy you're appreciating my little details and this comic overall! It means a lot to me! awwww, i love this kid! it's so cool how his character design has changed over the years...i really, really love what you settled on! so excited for more of him...and ivy (eventually)! Thank you!! It's true, I've posted character designs for almost everyone over the years...his has stayed pretty similar, but others have changed a lot. I'm so happy you like his final look! of course!!! also, looking at the other comments - i originally thought that maybe you had hand-lettered everything, but i then reasoned the letters were too font-looking and would have taken you an astonishing amount of time. i can't believe you actually did hand-lettering! it looks seriously amazing, and your dedication to everything you do is, as always, incredible. Oh my gosh, thank you so much! I made sure to mention I had hand-done it in the comments, because otherwise (assuming I've done my job right), you wouldn't be able to tell too easily! I used to use a handwriting font on Chapel to save time, but I tried that here and it didn't look as good because it didn't mesh so well with my inking, which on League is all old-school pen-and-ink. I'm so happy with how much you like him...! Oh my gosh... Oh my gosh Louis! I relate to this tiny shy baby so much, me too, this is me... I want to hug Louis Pepping.